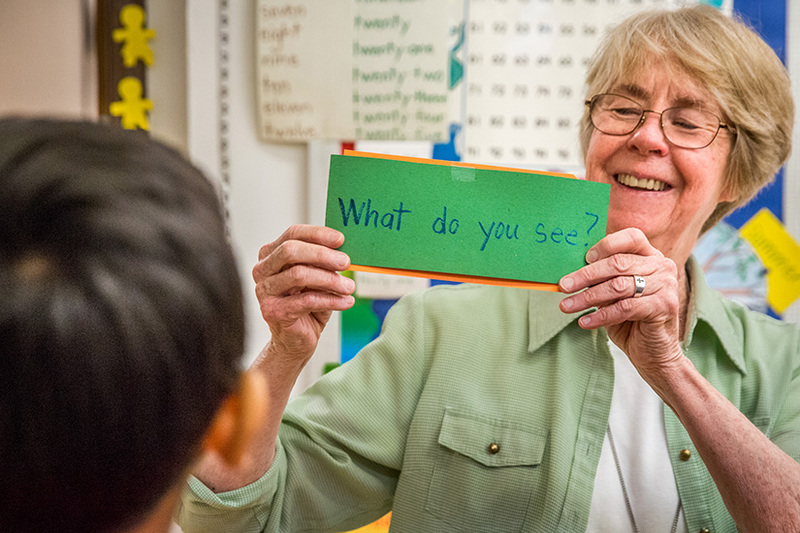 Sister Joan Stoverink, ASC, smiled as kindergarten student David Mung celebrated a victory in a game of “Go Fish Antonym” in class on May 21. Sister Joan tutors students at St. Stephen Protomartyr, many of whom are from Myanmar, as part of the English Tutoring Project. Four students at St. Stephen Protomartyr School in south St. Louis came together to play the game as part of their participation in the English Tutoring Project, which is completing its 20th year of helping immigrant and refugee students in Catholic schools acquire English language skills. It’s an initiative of the St. Louis Area Women Religious Collaborative Ministries. Joseph Thang, a third-grader at St. Stephen who came to America as a refugee at age 1, took part in the program as a kindergartner and first-grader and now is a graduate, having mastered English skills. “I liked game day,” he said with a smile, adding that the program was especially important in helping him understand instructions that were given in his classroom. Her children learn proper pronunciation, one of the biggest adjustments to make in learning the language, she said. She and her husband speak Zomi, a language originating in northwestern Burma (now Myanmar). The older of her two children in the program was shy at school, but with the confidence he gained from the tutor, he now raises his hand in class and asks questions. The women religious who founded the program 20 years ago looked for an unmet educational need and focused on students in Catholic schools who were not native English speakers. It fit the mission of women religious, whose communities had come to the United States many years ago to serve an immigrant population. The program began with women religious conducting the tutoring in a recreational vehicle that they drove to four schools with 64 students from 16 countries of origin participating. Now, English Tutoring Project services are present in eight schools at the request of the principals. More than 115 students are helped from as many as 16 countries of origin. The tutoring is offered at no charge to the families or schools. Sister Kathleen Koenen, a School Sister of Notre Dame, began work as administrator of the program in 2014, bringing a background in teaching and administration. When the program began 20 years ago, the women religious thought it might be needed for just three years, Sister Kathleen said. But the need remained strong and the congregations that sponsor it and the lay board members have extended their financial commitment to continue as long as they can and there’s a need. The yearly budget of about $350,000 is supplemented by grants such as $5,000 gifts announced earlier this year from The Saigh Foundation and from The Greater St. Louis Book Fair. Other grants and individual gifts are sought to assist with the program. Luis Llanos came to the United States from Colombia in 2001 and attended St. Cecilia School. He took part in the program for a year. “Of course I remember my time in tutoring with Sister Marilyn (Wittenauer, RSM). It was in the fourth grade, and it made such a huge difference in my transition to living and studying in the United States,” said Llanos, who later attended St. Louis University High School and the University of Notre Dame. He worked as as a manager at Accenture in Chicago, a global professional services company, until entering a master’s degree program in business administration at Northwestern University in Chicago. The English Tutoring Project is dedicated to ensuring that Catholic education is an option for families whose children struggle academically due to lack of English language abilities. The St. Louis Area Women Religious Collaborative Ministries founded the program in 1998. Grounded in Catholic tradition and social teachings, the English Tutoring Project provides on-site assistance to children from refugee and immigrant families. With the consolidation and closing of schools, the number of students served fluctuated and the countries of origin changed as new families arrived in St. Louis. All of the Catholic schools that the program served were in South St. Louis until 2014. Currently the project serves at St. Cecilia Catholic School and Academy, St. Frances Cabrini Academy, St. Stephen Protomartyr, South City Catholic Academy, Marian Middle School, all in south St. Louis; Holy Trinity School in St. Ann; St. Charles Borromeo School in St. Charles; and Immaculate Conception School in Dardenne Prairie. For more information, visit www.englishtutoringproject.com.